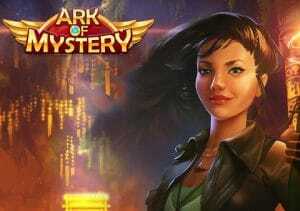 Join an intrepid female treasure hunter on a quest for Egyptian riches in Ark of Mystery, a 5 reel, 20 payline video slot from Quickspin. Boasting the developer’s usual design flair, the game also comes with a pair of interesting extras. Look out for respins with expanding wilds and special multiplier symbols that can boost payouts by up to 22x. Play on your PC, tablet or mobile from between 20p and £100 per spin. There are few better developers than Quickspin when it comes to design and Ark of Mystery is typically easy on the senses. Flanked by the columns of the chamber of the Pharaoh’s palace, the stone reels feature lower value royal values, ankh cross, scarab beetle and eye of Horus hieroglyphs. The top payer is Anna the explorer who’ll get you 50 times your total bet if you manage to land 5 on a row. The gameplay here is relatively simple but there are couple of features well worth noting. Wild Ark Respin feature – the wild ark symbol can land on reels 2, 3 and 4 only. When 1 does hit, you’ll be awarded a respin with the wild locking in place. On that respin, the wild expands to fill the position above or below. Another respin follows if the third position on a reel remains open. For example, if you landed a wild at the top of reel 2 you’d be awarded a respin. The wild would then fill the top and middle positions. On the next respin, it would fill the bottom position on that reel too. The wilds can land on the middle 3 reels offering the prospect of up to 6 respins with 3 wild reels. Multiplier Booster feature – look out for the pyramid symbol which can hit on reel 5. Each 1 of these increases a multiplier by 1. Land a winner and the payout is boosted by the multiplier shown which can reach a mammoth 22x! Quickspin video slots rarely disappoint when it comes to design and Ark of Mystery is no exception. The visuals are excellent and the mysterious, haunting backing track is an ideal fit. The features work well too. Expect to see both of them at regular intervals which keeps the pace high. The volatility is on the high side of medium and you can win 6,509 times your bet with the potential 22x multiplier! The appetite for Egyptian-themed video slots show no signs of waning. We’re not complaining when games like this come along. If you like the land of the pharaohs, then Ark of Mystery is one to add to the playing rotation. I would also try Age of Egypt from Playtech.